A self-serving national myth portrays France as immune to fascism. Yet the Vichy regime had deep roots in the country’s prewar history. Sigmund Freud defined repression as the move by which a subject tries to dispel their most troubling thoughts, images, and memories, or lock them away in the subconscious. Applying this metaphor at the level of whole countries, the repressed is the hidden face of the national story — the place where anything at odds with national mythology can be stashed away. In France’s case, the wartime Vichy regime has long represented such a troubling moment. The writing of France’s national story after Liberation in 1945 was thus designed to cast off its real history and mask its crimes. Postwar narratives were based around myths that served this purpose, focusing on a victorious France in resistance while portraying Vichy as nothing but the fallout of the military debacle of 1940. A further key myth characterized the Nazi occupier as the driving force behind the eradication of the principles inherited from the French Revolution. Put simply, this amounted to saying that “Vichy was not France.” General Charles de Gaulle himself said as much in 1944. But entrenching this myth required a national reconciliation process that could draw a line under the civil war produced by the occupation. This was well-expressed by the rapid issuing of ever-wider amnesties for wartime crimes between 1947 and 1953, but so, too, by the bid to produce a rose-tinted narrative of French history. Consciously or otherwise, this desire for reconciliation also had its effect on postwar French historians who had themselves lived through years of tragedy. This was apparent in the school of history writing founded by René Rémond. In the immediate aftermath of this dark period, this school was quick to argue that the authoritarian, nationalist, anti-democratic, and anti-Enlightenment right had been marginal in prewar France, organized in tiny sects around vague ideologies and unserious programs. This school of historiography thus presented these pre-war anti-democratic currents as if they had always been destined to defeat. In this view, the Vichy regime established in 1940 thus expressed nothing but the desires of a few marginal figures who took advantage of France’s military defeat and rallied behind Marshal Pétain as their leader — a respected figure, but one whose devotion in his old age was unable to ward off disaster. This narrative emphasizing the marginality of the forces behind the regime allowed France to nurse its wounded ego after the war without having to take any blame for Vichy. But this line of argument also presented two Vichys: Pétain’s Vichy, doomed to receive the blame for having taken over in a time of national disaster, and then the Vichy of prime minister, Pierre Laval, which had sunk into more active collaboration with Nazi Germany. Conferences that served the outside world as much as the academy offered back up this self-serving line of argument. Former collaborationist police officials could even pronounce learnedly on how difficult it had been to play Vichy’s supposed “double-game” (preserving France’s independence while maintaining peaceable relations with Nazi Germany), as they focused on what Stanley Hoffmann characterized as the notion of “the clean Vichy, the good Vichy” (supposedly untarnished by Nazi crimes). 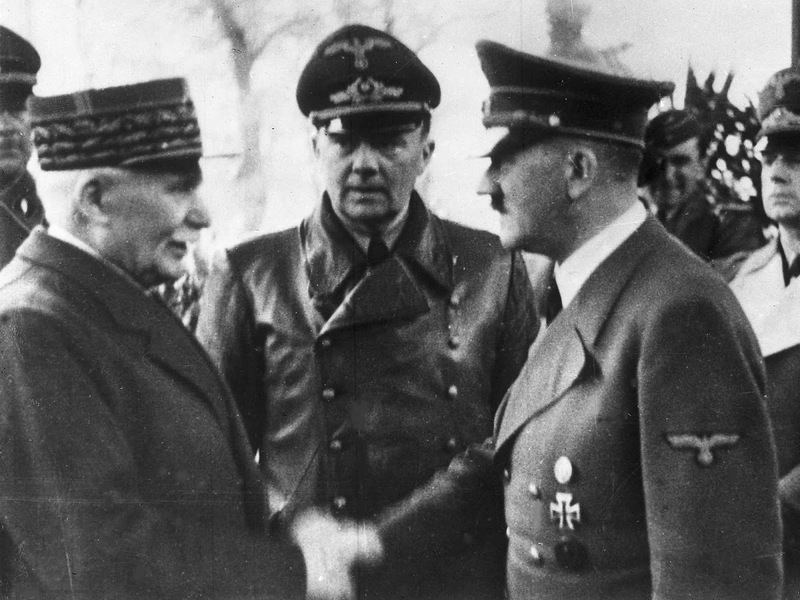 Robert Paxton’s 1972 book Vichy France marked the death knell of this mythologized history of the “good Vichy” and its “double game.” The American historian demonstrated that Pétain’s decisions had their own internal logical dynamic. This was highlighted by the speed with which the new regime established both a legal framework to authorize persecution and an ideological framework designed to trash the Enlightenment heritage and exorcise the ghosts of the prewar Popular Front. Given the evidence marshaled by Paxton, it was clear that the rootedness of the Republic and its values had not only failed to stop the advent of a collaborationist regime. This regime was established with the connivance of a large part of France’s political but also administrative, economic and cultural elites. Vichy had its own lines to play in the concert of regimes drawn along in Europe’s slide toward fascism. As Europe fell under German occupation, Vichy’s leaders were eager to present themselves as good pupils of the “New Europe” that Hitler sought to create. To continue with the psychoanalytic metaphor, a central mechanism in this defensive stance, alongside repression, was what Freud termed “displacement.” In the face of Paxton’s findings on Vichy’s role, the school of historiography founded by René Rémond can be seen as a displacement operation. Before Paxton’s book, Rémond’s analysis had long asserted that Vichy marked a total rupture with what he called the “three traditional families of the French Right” (Legitimism, Orléanism, and Bonapartism). Now the main goal was to emphasize Vichy’s lack of roots in French society; even if France was not “in London” with the exiled De Gaulle, it was never with Vichy either. The only exceptions, in this view, were isolated members of parliament like Pierre Laval or plebeian adventurers like Jacques Doriot (a former dissident communist who became a fascist and raised French troops to fight with the Wehrmacht against the USSR). Cases like the latter served to highlight a contrast with 1930s right-wingers who had not rallied to Collaboration. In this reading, the regime was a bitter weed that had flowered in shallow soil. In his 1983 book, Sternhell demonstrated that these sworn enemies of Enlightenment thought and the idea of individual and social emancipation – currents who linked the social and national questions, but without questioning social structures themselves — were the forerunners of fascist thinking. The latter had combined a rejection of the Enlightenment tradition (albeit without wanting a return to the ancien régime) with a revision of Marxism following the trail of Georges Sorel. The existence, or otherwise, of a “French fascism” thus became one of the most important historiographical controversies of the late twentieth century. The multiple and fierce responses sparked sometimes strange comments. Some considered Sternhell’s analysis distorted by his own personal history (as an Israeli who had escaped the extermination of the Polish Jews). Some have even asserted that historians from English-speaking countries can never fully grasp the complexities of France’s contemporary history, given their supposed distance from French national realities. Such claims are bewildering, at the very least. In fact, in most cases, each fresh wave of critiques of the “French immunity” thesis has come from outside France. The English-speaking historians whose work has sometimes been questioned on the grounds that the nuances of the archives supposedly escape them include not only Paxton but also people like Robert Soucy, William D. Irving, Samuel Kalman, Kevin Passmore, Samuel Goodfellow, Brian Jenkins, Chris Millington, Sean Kennedy, and Caroline Campbell. With the exception of Soucy, none of these authors have ever been translated into French. Yet such historians have helped show how, long before 1940, considerable fringes of French society and especially its political, economic, and intellectual elites were sympathetic to fascist adventures (however shy they were about admitting it, as they sought a “French formulation” of their approach). Such historians have also highlighted that antisemitism was far from limited to an extremist like Charles Maurras; the backing for the persecution of the Jews went far beyond that, as we see from the recently published diaries of the philosopher Alain. The organic ideologue of the liberal Parti Radical, Alain was thus the quasi-official ideologue of the prewar Third Republic. Similarly, we could take the acclaim in the summer of 1942 for Lucien Rebatet, the author of what is often presented as the bestseller of the Occupation era, Les Décombres, published by Denoël. A call for the murder of “Jewry,” this book sold around two hundred thousand copies. Or, indeed, the success of Jud Süß, the antisemitic Nazi film produced at the behest of Joseph Goebbels, which came out in France in February 1941 and continued to be screened until 1944, with an estimated 1 million viewers. These are telling examples, even without ignoring the many acts of solidarity and the even greater number of French people — functionaries and otherwise — who did disapprove of the persecution of the Jews. Apart from historians from the English-speaking world, we should also underscore the importance of the works of the political scientist Michel Dobry. He has methodically deconstructed the thesis of “France’s immunity from fascism” and its methodological and intellectual presuppositions, though the defenders of this thesis contemptuously refuse to debate him. Dobry was not only the instigator of the first volume challenging the idea of French exceptionalism (bringing together contributions by French as well as foreign researchers) but also one of the first to deny that the right-wing street movement Croix de feu (1927–1936) and the Parti social français (PSF; 1936–1940), each led by François de la Rocque, could be considered republican mass movements that served to ward off the fascist threat. This latter line of argument, defended in particular by Serge Bernstein and his epigones, makes it particularly difficult to understand the Croix de Feu and PSF leader’s loyalty to Pétain, and indeed the Vichy regime’s adoption of a motto — “Work, Family, Fatherland” — first championed by de la Rocque and his movements. Indeed, here we get to the real importance of the question of what the Croix de Feu represented between 1933 and the Vichy period. Seeking to counter the latest developments in what Didier Leschi termed “the strange case of De La Rocque,” defenders of the thesis of “French immunity” published his “notebooks” in 2014. In his introduction to that volume, Serge Berstein was eager to emphasize that, given that de la Rocque had no post within the Vichy regime, he could not be considered a French “fascist.” For Berstein, up to the very end the Croix de feu and PSF leader was a “republican on the edges of the Republic” who had “essentially accepted the inheritance of the French Revolution” and rejected antisemitic discrimination. In this view, de la Rocque had loyally followed Marshal Pétain, but with the blind faith sometimes seen in soldiers. And nothing more. And even if the “ideology of the new regime was [supposedly] closer to the PSF’s,” de la Rocque nonetheless remained deeply “republican.” Indeed, this publication was entitled “Why I am a republican,” thus adopting the title of a text by Marc Bloch published in the clandestine organ of the general committee of Resistance studies in 1943. The unaware reader would doubtless find material here to establish a parallel between de la Rocque’s trajectory and Bloch’s and consider, in all good faith, that in its darkest years the Republic had an unbroken spectrum of partisans encompassing both men. Yet de la Rocque’s text bears the ambiguity of a period – 1943, after the Soviet victory at Stalingrad – in which many began to feel the wind was turning, and when convinced Vichyites now passed over to the Resistance or discovered their second soul as opponents of Pétain’s. After the fall of Benito Mussolini, even collaborationist pamphleteer Robert Brasillach considered it necessary to stop giving in to “quixotic” initiatives and attempted to transform Je suis partout into a literary review, now that the fight was lost. Yet to the last, de la Rocque ideologically agreed with the fundamentals of the Vichyite Révolution nationale, loyalty to Pétain, and the interest of the fatherland. De la Rocque and others’ use of the word “république” provides no salvation for those who participated in the worst disaster in France’s twentieth century. In fact, this term was widely used by nationalists in the interwar period and even under the German Occupation so that they could distance themselves from a fascist label that troubled French-nationalist feeling, even if they did not in fact accept the substance of French republicanism. The polysemy that these different tendencies attached to the word “république” allowed its use by a “National-Social Republican Party” founded by Pierre Taittinger after the Popular Front government dissolved his right-wing street movement, the Jeunesses patriotes, in 1936. Marcel Déat, who fancied himself a representative of the “left wing” of the Collaboration, evoked not only the Republic but even the Revolution in his cause. Yet this was nothing new. Even nineteenth-century nationalist leader Paul Déroulède had proclaimed the need for a “plebiscitary republic” and at the turn of the century many anti-Dreyfusards called themselves “republicans” even though they rejected Enlightenment thought. The subtitle, referring to the PSF as a “mass right-wing party” itself summarizes the tone of this book, as well as underscoring the different evaluations of this party’s identity. A mass right-wing party; neo-Bonapartist; to the right of Christian Democracy; a prefiguration of de Gaulle’s postwar RPF, given its modernizing thrust and desire to rally the nation together; an improbable amalgam between a conservative ideology and a Socialist/Communist organizational form. Even for those who defend the thesis of “French immunity,” defining this party is clearly a delicate matter. Reading the different contributions, we can see this party as both modern and archaic. It was hostile to the classical right’s economic laissez-faire and fiercely opposed to state intervention in the economy. It (belatedly) played the game of elections even as it rejected what de la Rocque termed “electoralism” (“this too-widespread deformation that sees the verdicts of universal suffrage as a higher goal”). It was in favor of votes for women but also of “votes for families.” It was an anti-systemic party that attracted the sympathies of established elites. It was a party that rejected antisemitism but integrated powerful antisemitic federations (in Lorraine and Algeria). Little matter what you label it, so long as you don’t term it “far-right” (a “polemical, instrumental piece of nonsense,” according to co-editor Jean-Paul Thomas) or, even more so, an example of French “fascism.” We could talk until the cows come home about whether de la Rocque’s political profile does indeed correspond to the “essence of fascism.” But he was far from a republican precursor of Gaullism. To say that would mean being a bit quick to forget the void between defending the values of Free France and of Marshal Pétain, indeed at key moments of French history. Didier Leschi is a leading civil servant and director general of the office français de l'immigration et de l'intégration. Laurent Kestel is a doctor of political science and author of En marche forcée .